Welcome to our British Columbia page! BC has many great resources available for childcare practitioners, home-based daycares, families and more! The Be a Sun Safe Kids was developed by the BC Cancer Agency Prevention Programs. There are three sun safe lessons for childcare providers to use with preschool aged children. Please download this free resource: Be a Sun-Safe Kid! In the Healthy Beginnings 2-5 manuals, you might recognize some of the resources we are sharing from Decoda Literacy Solutions, Leap BC. 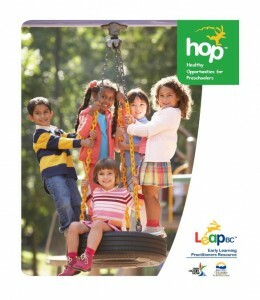 LEAP for Practitioners has lots of great material that includes HOP (Healthy Opportunities for Preschoolers) and Food Flair for Childcare. Both of these full manuals are available for purchase from Decoda Literacy Solutions and many pages are also available for free download. Please visit the LEAP BC website for more information and full resources. The Healthy Beginnings 2-5 Guidelines are in addition to the BC Child Care Licensing Regulation. They are voluntary guidelines developed by experts in physical activity and nutrition to provide guidance to early learning practitioners who want to provide the optimal health promoting childcare environment. These guidelines reflect best-practice. Healthy Families BC is a website created by the Province of British Columbia and hosts many resources, materials, contacts and supports for all BC families. On this site, you will find information on food and nutrition, active lifestyles, pregnancy, parenting and more. Visit the website for more ideas and ways you can be a BC healthy family.